Tamela Ivie was 13 when she got her first tattoo done. It was the word "baby" on her right shoulder. Now she is 26 and has close to 40 tattoos all over her body, including on her cheeks and left hand. 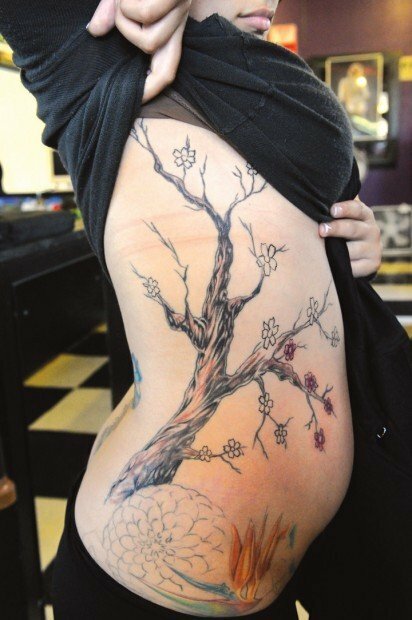 "Every tattoo I have represents something in my life that happened at some point," she said. For Richard Pinkerton, his first tattoo came when he was 21 after getting out of the service. Now he is 63 and couldn't tell you how many tattoos he really has. While Ivie and Pinkerton are among those who aren't afraid to express themselves through their appearance, they still fight negative stereotypes about tattoos from others. "Tattoos are becoming a lot more accepted," said Jeanie Weedman, manager and piercer of Downtown Tattoo and Piercing in Albany. "But that doesn't mean everyone enjoys them." In a 2006 Pew Research Center survey, 40 percent of people ages 26-40 say they currently have a tattoo or have had one in the past. Weedman has 27 tattoos, mostly from tattoo artist Casey McCombie, one of the three artists employed at Downtown Tattoo and Piercing. With the exception of a year off in 2006 to work elsewhere, Weedman has worked at Downtown Tattoo and Piercing for five years. During her other employment, Weedman noticed her co-workers' attitudes change after she switched from long-sleeve to short-sleeve shirts at work. Once they saw her tattoos, people began treating her as if she was a horrible person, she said. Pinkerton, who lives in Albany, has had a whole different experience while working as a building inspector for Linn County. He has tattoos up and down his arms and legs. When he was discharged from the service in 1969, he got his first tattoo. He was a construction worker until 15 years ago. Pinkerton chose to cover over tattoos on his arms when he began working as a building inspector 15 years ago. Early in his life, Pinkerton sported a tattoo of a devil holding a world in flames and another of a woman eating grapes. The tattoos on his legs are newer, most of them representing all the places he has been. When people call with questions, they will ask for the man with all the tattoos. "I mostly have women who look at my tattoos," he said. "A lot of men will just say ‘nice ink.'" Pinkerton said his favorite tattoo is an ambiagram on his leg from Dan Brown's "Angels and Demons" that says Earth, Air, Fire and Water. Every time Pinkerton has work done, he also has another small fish added to his right knee. As of right now he has 11 fish. Following an agreement with his wife, Pinkerton won't cover any more skin, promising only to touch up existing tattoos. Tamela Ivie, 26, of Scio has stars on her cheeks. "I got the inspiration from Rainbow Bright," she said. "I had a tough childhood and Rainbow Bright was the doll I connected with in the tough times." Ivie said her favorite tattoo is the stars on her cheeks. "There are still mornings that I surprised when I wake up and find my face altered," she said. Ivie has had many opinions about her tattoos, some positive and some negative. "A lot of people assume that since I have so many tattoos I am cool with drug use and smoke pot," she said. "I get quite a bit of attention from bikers too." She added that just doing everyday tasks like going to the grocery store are interesting. "One thing that I have learned since getting my face tattooed is that people seem to think that visible tattoos are an invitation for opinions whether positive or negative," she said. She has had people walk up to her and start touching her face, and others have grabbed her arm in order to study the tattoos there. Currently unemployed, Ivie knows she will have to cover up her tattoos if she enters the professional world. "I will have to invest in makeup for covering up tattoos," she said. " I will be sure to cover up the tattoos on my face, neck and hand." Although Ivie won't visibly react to people's comments, the negative remarks do hurt, she said. "Just because we have tattoos doesn't mean we don't have feelings," she said.